Teapots are complex objects steeped in history, world culture, and art. For collectors, they offer a wonderful study in contrast and variety. For artists, they present endless possibilities within the context of design, decoration, and scale. The Clay Art Center, in Port Chester, NY presents “TeaTime”, a survey exhibition and a day of presentations, discussion, and tea tastings. See below. 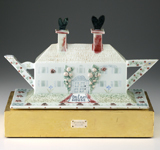 FERRIN CONTEMPORARY’S Teapot Collectanea, is an ongoing on-line collection of teapots sourced from private collections and directly from artist studios. Tea Immersion Presentations and tea. • Leslie Ferrin, Author of Teapots Transformed; Exploration of an Object, will present an overview of contemporary ceramic teapots. 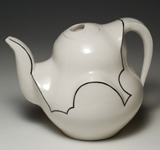 • Ulysses Dietz, Senior Curator at the Newark Museum will offer an historical survey of the teapot both as a functional form and as an artistic challenge. • Michael Harney, VP of Harney & Sons Master Tea Blenders, will speak about tea tastes and traditions in various tea growing lands and how that has influenced tea pots. • Judith Schwartz, Professor of Art & Art Professions at NYU, will moderate a panel discussion after the lectures. • Tea tastings will culminate the event poured by Harney & Sons. Click here for more on Tea Immersion. Click here for more on TeaTime. 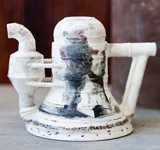 Ferrin Contemporary presents Teapot Collectanea: an online collection of teapots sourced from private collections and directly from artist studios. Ranging functional to conceptual teapots, produced by both emerging and established artists and designers, this ongoing changing collection is curated by Leslie Ferrin, author of “Teapots Transformed: Exploration of an Object”. Ferrin’s understanding of the teapot genre assures that each of the pieces offered here makes a distinct contribution to this iconic form. Click here to view Teapot Collectanea.